Amazon is stoking interest in its drone delivery plan with a new video starring TV host Jeremy Clarkson and a "naughty, naughty" bulldog. The video, published Sunday, imagines a family in the "not too distant future" receiving a replacement soccer shoe via drone after their bulldog chews up the original. It is the first such video from Amazon in two years, showcasing new flight footage and revealing a new design for the company's drone fleet. "In time there will be a whole family of Amazon drones, different designs for different environments," Clarkson says, narrating footage of a drone flying over a suburban area. "This one can fly for 15 miles," he says. "And it knows what's happening around it. It uses 'sense and avoid' technology to, well, sense and then avoid obstacles on the ground and in the air." Amazon first spoke publicly about its plans for the Prime Air delivery service in December 2013. "I know this looks like science fiction. It's not," Amazon CEO Jeff Bezos said on "60 Minutes." 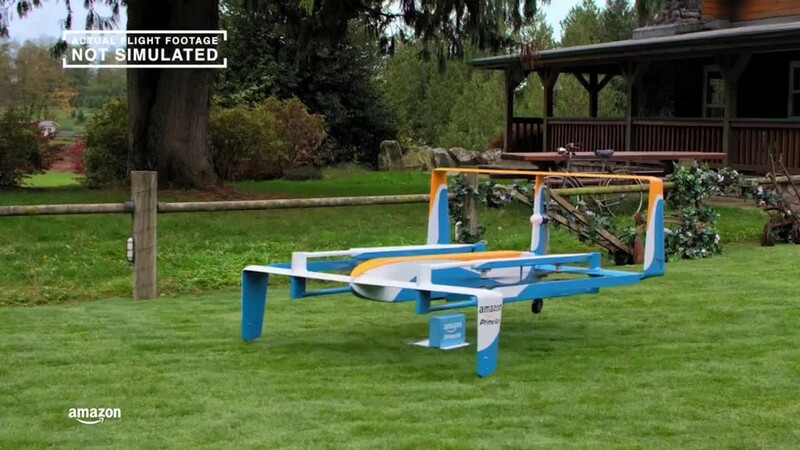 Back then, Amazon shared footage of a delivery drone taking a package to a customer, but the company's engineers have clearly made many enhancements since then. In Sunday's new video, the drone flies much higher and seems to be more stable. Clarkson, the narrator, is known around the world as the host of the BBC's "Top Gear." In the promotional video for Prime Air, Clarkson describes Amazon's drone design in a way that is meant to assuage safety concerns. "After rising vertically like a helicopter to nearly 400 feet, this amazing hybrid design assumes a horizontal orientation and becomes a streamlined -- and fast! -- airplane," he says. As the drone approaches its destination, the customer receives a message on a tablet "to say that your Prime Air delivery is arriving," he continues. Once approved for a landing (via a tap on the tablet) the drone "goes back to vertical mode and scans the landing area for potential hazards. This amazing innovation then lowers itself slowly to the ground, drops off the package, and flies straight back up to altitude." An Amazon spokesperson did not immediately respond to a request for further comment. But the company's website was updated on Sunday with new information about its plans. 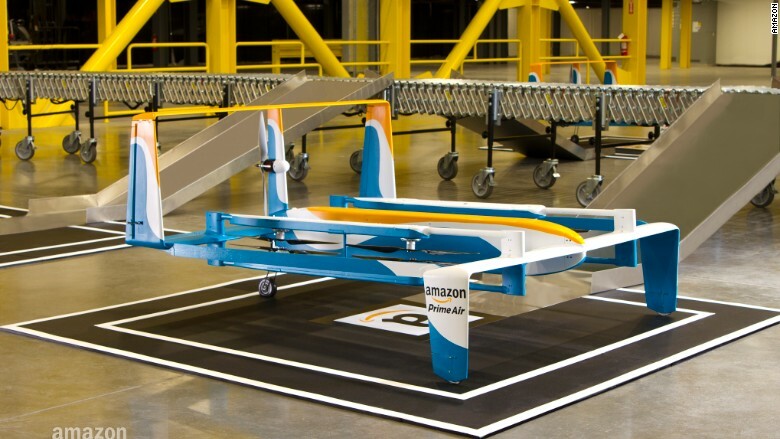 "Amazon Prime Air is a future service that will deliver packages up to five pounds in 30 minutes or less using small drones," the site says. "Flying under 400 feet and weighing less than 55 pounds, Prime Air vehicles will take advantage of sophisticated 'sense and avoid' technology, as well as a high degree of automation, to safely operate beyond the line of sight to distances of 10 miles or more," it adds. Amazon's specifications are partly a response to FAA regulations. The government is working on rules for drones that weigh less than 55 pounds. An early draft of the rules only allowed drones to fly within a user's line of sight. Amazon expressed its disagreement with this restriction over the summer, and the new drone video asserts that the vehicles can safely go further distances. Amazon's website was also updated on Sunday to say that "we are testing many different vehicle designs and delivery mechanisms to discover how best to deliver packages in a variety of environments." Amazon says it has "more than a dozen prototypes." The FAA approved tests in the U.S. earlier this year. "Putting Prime Air into service will take some time," Amazon said. "We will deploy when we have the regulatory support needed to realize our vision."